Easy to use, quickly does exactly what it says it will do, output quality good. What more can I say?! This product is excellent at what it does. I have yet to convert a file that has not worked, and it is simple to use. 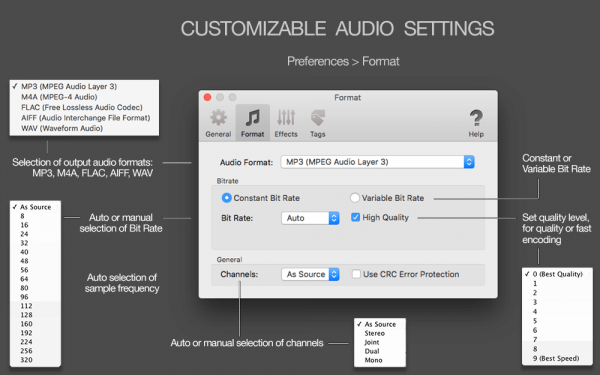 "MIDI to MP3" converts easily and quickly MIDI music to MP3, WAV, M4A, FLAC or AIFF formats on Mac OS X. 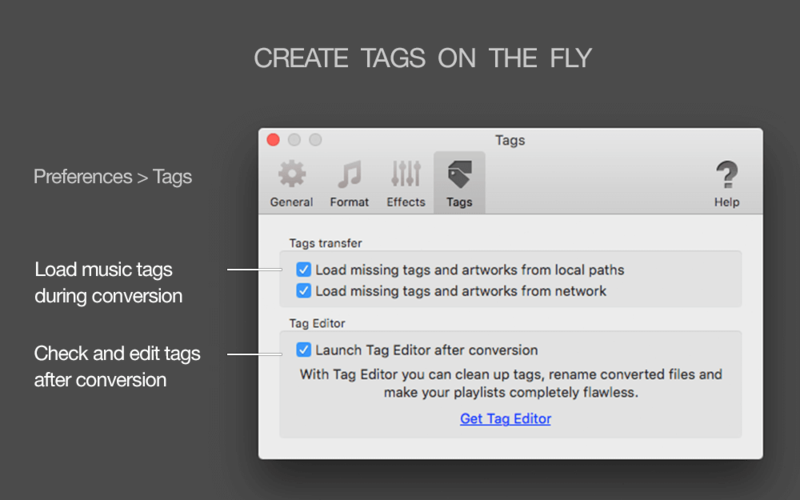 Pleasant features like automatic volume adjusting, audio effects, automatic audio settings, smooth interface, batch processing, automatic tag organiser, detailed progress and integration with iTunes allow you to convert your favourite MIDI Audio files to MP3 and other popular music formats quickly and effectively. “MIDI to MP3” converter accepts and encodes MIDI Audio Files of "Format 0" and "Format 1" to MP3, WAV, FLAC, MP4/M4A or AIFF formats with automatic or customizable audio settings, such as Bit Rate, Sample Rate and Channels. To start a conversion, just drop .mid files or folders to the app’s window or icon. 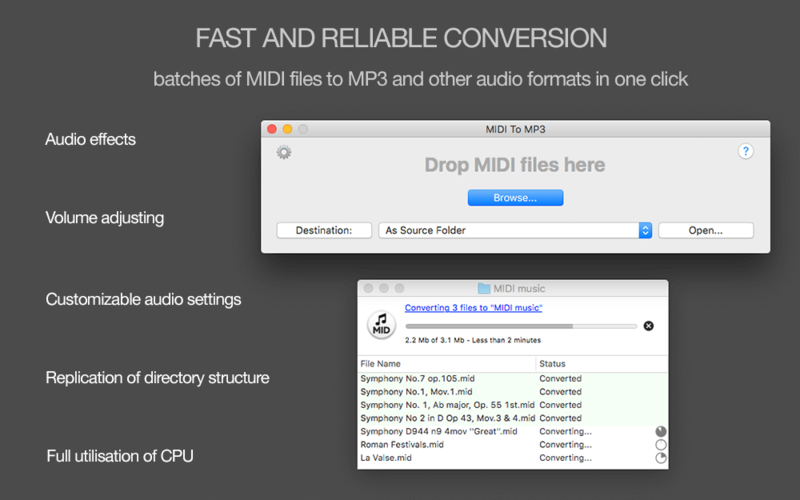 “MIDI to MP3” converter will estimate conversion time, and provide details of the conversion of every source file. You will be informed when conversion of all files is finished. 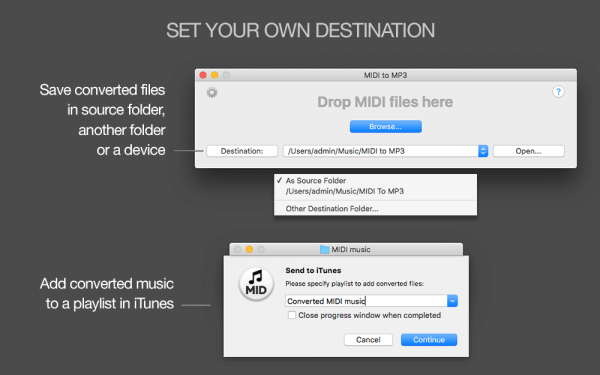 "MIDI to MP3" allows converting an unlimited number of music records and folders in one click. The application supports multiple conversions simultaneously. If you convert a batch of folders, "MIDI to MP3" will replicate the structure of source folders. It is especially convenient if you need to encode entire MIDI music collection to MP3 or another audio format. “MIDI to MP3” estimates Bit Rate, Sample Rate and Channels automatically, and applies optimal settings to output MP3, WAV, MP4/M4A, FLAC and AIFF files. 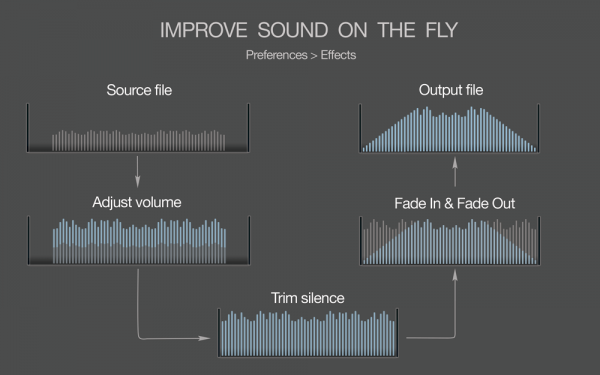 It guarantees output quality sound, saves your time and hard drive space. If you would like convert to a format with a particular Bit Rate*, Channels, etc., just change settings in the Preferences. 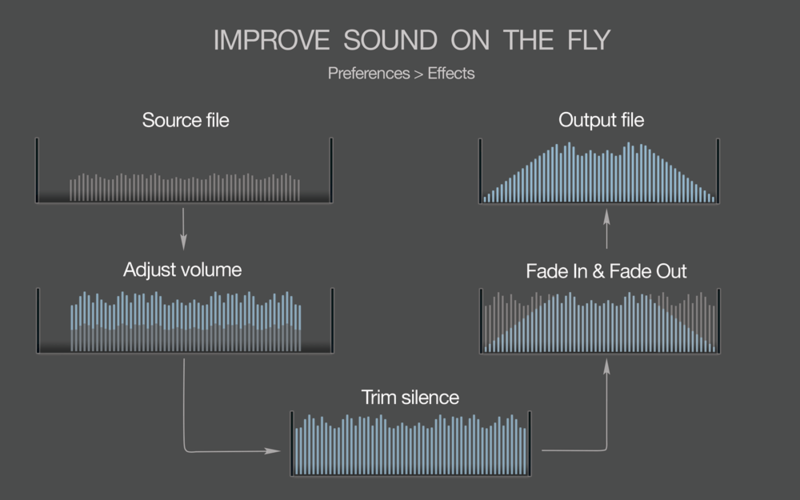 You can tailor audio effects to improve the quality of output sound: adjust the volume of too quiet tracks, trim silence and apply fade-in and fade-out effects for smooth playback. “MIDI to MP3” allows exporting converted music to new or existing iTunes playlists by the quick and easy way. “MIDI to MP3” fully utilizes all CPU cores. Encoding in separate processes makes it reliable and “crash free”. * Note: We recommend set Bit Rate at 128 or lower number if you are going to burn music files to CD and use it in your car. Many CD car players may not playback audio files with Bit Rates higher than 128 kbps.